The Five-Star Café at the Freehold Borough High School is one of Freehold’s best kept secrets. The café is a functioning restaurant that operates from 7:45 a.m. to 1:45 p.m. on Wednesdays, Thursdays, and Fridays. Students who are members of the Culinary Arts Academy prepare and serve all the food. The café is open to the public, and the prices are very reasonable. If you are interested, use the main entrance off of Robertsville Road and check in at the office. The school encourages people to visit as it helps challenge the students. Officers from the Freehold Borough Police Department try and visit on a regular basis. 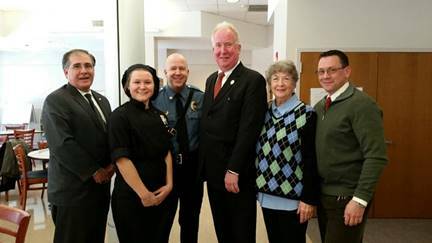 Pictured above from left to right are FB Business Administrator Joseph Bellina, FBHS Student Amanda Rocha (a senior and member of the Culinary Academy), FBPD Captain Craig Dispenza, FB Mayor Nolan Higgins, FB Councilwoman Sharon Shutzer, and FBPD Lieutenant Mike Sweetman.